We host a campsite dinner Tuesday night with Salt Lake City residents and newlyweds Nicole and Dave. Sherry and I quiz Nicole about choosing the best local day trip for our limited amount of time here. She suggests several of her favorite hikes among the many breathtaking (both visually and for us lowlanders – physically) hikes here, but we are in the mood for a short road trip. She assures us that we will be amazed at Utah Olympic Park near Park City only about an hour away. Great suggestion Nicole! 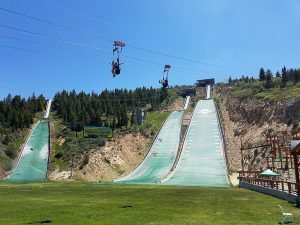 The 2002 Winter Olympics were hosted at the Utah Olympic Park and in the surrounding area. The park now houses an interactive museum, offers tours of the popular training facilities and features thrill rides for all ages. I could sit beside the aquamarine pool in the park and watch the ski jumpers practice all day. When you see the video of our visit you may wonder why the water bubbles before each jump. Turns out breaking the water surface tension with bubbles makes for a slightly softer landing for the jumpers. We return to Provo after shopping and dining in Park City. Main Street here is lined with upscale dining, shopping and beautifully restored old buildings. On the way home this time we pass by Bridal Veil Falls in the afternoon sun and I finally get a photo of it in the fading light! I am with you on that! I could sit all day watching them flip up in the air though. WOW!! I thought Valerie and Priscilla were adventurous but I think you have them beat with this one. Well for goodness sake don’t tell them that! We don’t want them signing up for some triple Iron Man marathon cross country swim to prove you wrong!! The gentleman calls attention to the good points in others; he does not call attention to their defects. The small man does just the reverse.